FL Studio 6 is a mature, powerful and flexible music making environment. Great value for money. The DirectWave multisampler. Separate Piano Roll snap control. Updated generators. New effects. Lots of improvements. Still great value, and a free update. Control surface support is primitive. Still no MIDI SysEx support. 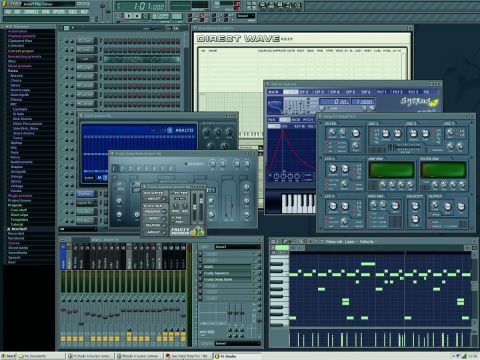 FL Studio is a self-contained software studio. As such, it contains everything you need to record, arrange, mix and produce a finished track (minus the computer and an audio interface of course). Unlike Propellerhead´s Reason -- a closed, self-contained solution -- FL Studio can make use of third-party VST and DirectX instrument and effect plug-ins. That said, a selection of competent synths and effects comes in the box. At the core FL Studio 6 is crammed full of new features (more on these later), but Image Line have also invested a significant amount of time and effort in improving and rewriting elements of the core application. Although many of these changes are behind-the-scenes, they´ve facilitated some of the more visible improvements, and helped to create a better, more next-gen platform for future development. FL Studio now feels less like a vanilla Windows application, as the old menus and pop-ups have been replaced with ones that match the application´s overall look and feel more closely. More than mere eye candy, some of the new menus also offer improved functionality. The Generator preset menus, for example, can now be organised into sections or even displayed in a tree structure, making it easier to quickly find a given preset when the creative juices are flowing. MIDI support has been improved, and as a result, FL Studio can now accept multiple MIDI inputs simultaneously. Users no longer need to resort to convoluted workarounds involving third-party MIDI utilities. Crucially, it´s finally possible to connect and use a MIDI keyboard and control surface at the same time. What´s more, the MIDI synchronisation clock can now be sent to more than one output port at the same time, although FL Studio does still lack any support for MIDI System Exclusive data, restricting its compatibility with external hardware. The mixer window has received a host of improvements. It´s now possible use more than four send channels at once, as any of the 64 input channels can now be reconfigured as a send channel. In addition, it´s now possible to re-arrange mixer channels within the mixer window, making it easier to stay organised and in control during complex mixing sessions. The sample browser has been revamped and now features two different search engines for quickly locating samples and Generator presets. Unfortunately, search results have to be stepped through one at a time -- they don´t appear as a complete list -- but the browser now remembers its state between sessions, which is a welcome improvement. Sequences in FL Studio are programmed either in the step sequencer or the Piano Roll window. The step sequencer has seen only minor improvements -- it´s now possible to replace a Generator without having to copy and paste any of the sequences that trigger it. The Piano Roll, on the other hand, has been updated in a number of ways. Most significantly, it now has a dedicated snap setting -- the one on the main toolbar now only applies to the Playlist window, where patterns are arranged into complete songs. Also new is the scale detecting feature, which can detect the scale used by a sequence and change the grid background of the Piano Roll window to match, showing ‘accidental´ notes as black notes. Furthermore, it´s now possible to edit all control events in the lower half of the Piano Roll window, and individual notes can be nudged backwards and forwards using the arrow keys. There are too many other Piano Roll tweaks to mention here, but it´s safe to say that FL´s Piano Roll remains one of the best sequence editors we´ve come across. It still puts some professional-grade sequencers to shame. Elsewhere, the Playlist window has been treated to some noteworthy updates. Patterns can now be inserted, cloned, renamed or deleted from a right-click menu, and existing patterns ‘exploded´ into multiple patterns by channel (useful for splitting up an imported MIDI file). It´s now possible to scroll and zoom horizontally as well as vertically in the Playlist window (by holding down the Shift and/or Alt keys while using the mouse wheel), and the Live mode has also been improved. The current song position can be relocated on the fly and automatically snapped to bar boundaries to keep everything in time. All good so far, but there´s one of FL Studio 6´s new features that stands out above all the others: the excellent DirectWave multisampler. Until now, FL users have had to cobble together makeshift multisamplers using lots of Fruity Samplers in combination with a layer channel. It wasn´t exactly elegant but it worked. DirectWave has all of the features you´d expect from a mid-range sampler and a few unusual extras. These include a built-in utility that can quickly prepare a sampled version of a VST plug-in patch in a couple of mouse clicks, and the ability to sample incoming audio. Unfortunately, DirectWave has to be loaded as an effect to enable this latter feature, but it´s not possible to actually play the sampler when it´s loaded in this configuration. So, a sample needs to be saved and then reloaded into an instance of DirectWave that´s loaded into the step sequencer instead. Although it´s not as refined and slick as Reason´s NN-XT or the industry heavyweights like HALion or Kontakt, DirectWave is capable and powerful. Elsewhere, a new tool has been developed to provide convenient access to the existing SampleFusion library (this is already available for registered users of FL Studio to download). The download manager retrieves and manages DirectWave soundbanks, making it easy to locate and download a new set of sounds in the middle of a recording session. This is absolutely ideal for users who have high speed internet connections, but downloading the large sound libraries with a modem could be a miserable experience. The overall quality of the soundbanks is roughly comparable to that of the banks that come with the other soft studios. Sytrus, the most advanced of FL Studio´s bundled synths, has also been revamped in this version. It´s now possible to arpeggiate Sytrus using an envelope, and the synth can now analyse the volume envelope of a sample and use this as a basis for a patch´s volume envelope. Sytrus was already quite a deep synth, but this has made it even more complex. The Wasp synth has been reborn as Wasp XT, although the original version is still included for the sake of backwards compatibility with old projects. The FPC drum sampler now has per-pad automatable envelopes, making it possible to program more expressive drum parts than before. In addition, FPC can now load and save individual pad presets, so it´s possible to build complete kits from existing pad configurations. Several new effect plug-ins have been added, including Fruity Reeverb 2, EQUO, Fruity Delay Bank, Fruity Squeeze and a multiband compressor. All of these are welcome additions to an already strong line-up of bundled effects, though some users will be disappointed that there isn´t a convolution reverb in there. FL Studio 6 XXL is one of the most affordable, flexible and complete soft studios around. It´s as easy, quick and downright fun to use as it ever was, but now has enough depth to keep even the most power-hungry user happy. The addition of DirectWave has filled the most obvious hole in the software´s armoury, although the control surface support needs to be improved if it´s to remain competitive. However, this comprehensive update (which is free to registered users) will do just fine for now.